Before I got allergic to everything I ever liked, these cupcakes were my favorite meal of all time. They are actually delicious, which is how come I had to invent this recipe. One of your parents has to help, on account of you’ll probably get bored halfway through and walk away. We bring these cupcakes to parties, because even the kids that aren’t allergic to stuff think they taste spectacular. That’s an actual fact. 1 cup of the best food on Planet Earth, Kraft Jet-Puffed Marshmallow Crème or Ricemellow if you’re allergic to food dyes. Preheat the oven according to the directions in the box. Put 15 cupcake cups in your pan, on account of you’ll have more than the box says. Follow the directions on the box, but use Earth Balance butter or ghee instead of butter. Fill your cups ¾ of the way full on account of they grow. This stuff smells delicious but don’t sneak a taste on account of the raw eggs will make you barf. Let them cool for a while before you squirt anything into them. 2. Make the delicious, creamy, marshmallow-y filling. While the cupcakes cool, beat the butter with beaters. Throw in ½ cup of powdered sugar. Add vanilla, and half the coconut milk. Alternate like that until the sugar and coconut milk are all used up. Then add the delicious marshmallow cream and sneak a little with your finger so you can taste the best ingredient on Planet Earth. Beat it until it’s perfectly smooth & stick in the fridge until you’re ready to squirt it. Have a grown-up cook the coconut milk until it’s super hot, then pour it all over the chocolate chips. Stir it all up until it’s smooth and very delicious. Also, sneak some of this with your finger. Leave this stuff on the counter until you’re ready to splat it all over the cupcakes. If you have a cupcake corer this is the time to use it. Not everybody has one of those things, though. .I don’t. I just use a pastry bag with a star tip. (You can make one with a freezer bag) Stick it into the top center of the cupcakes and squirt. Lick your fingers whenever possible, but don’t spread your germs or you’ll get in trouble. Use a frosting spreader for this. This is a very easy time to sneak tastes because it’s messy and you can say you’re cleaning your fingers. Throw all the ingredients into a bowl and beat them until they turn delicious and smooth. Put it in a pastry bag with a small tip and make squiggles on your cupcakes. 7. Eat your delicious meal! 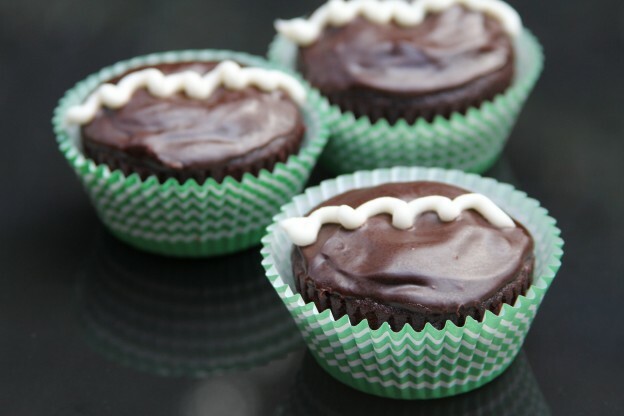 This entry was posted in Uncategorized and tagged cream-filled chocolate cupcakes, dairy-free, gluten-free, hostess cupcakes on September 13, 2013 by admin. Don’t forget – if you don’t have a pastry bag for the squiggly icing, you can put it in a ziplock bag and cut a little corner off the bottom. Use that, or the pastry bag, to draw all kinds of fun designs, initials, or smiley faces on them!! That’s an adorable idea, David. Thank you for the suggestion!